The impact of legislation designed to streamline the delivery of Local Government through the cutting back of Northern Ireland’s Councils from 26 to 11 was the subject of an SDLP meeting held In Newry last week. The Deputy Leader of the SDLP, Dolores Kelly MLA, was the guest speaker at the function hosted by Councillor Connaire McGreevy. 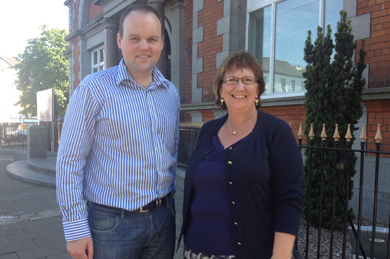 Newry and Mourne SDLP Councillor with party deputy leader Delores Kelly MLA. The issues discussed focussed on the additional powers that will be coming to the new merged bodies. The importance of representatives on the restructured Council’s having the necessary skills to cope with the additional challenges was emphasised by Dolores Kelly. Councillor McGreevy said: “The meeting provided a very important insight into the how Local Government would have to adapt and change in the coming years. “First of all we will have to be sure that we as public representatives have the necessary skills set to be able to meet the demands of a radically changed Council environment. “With the quota for election to the new merged Council’s of Newry and Mourne and Down District, the current very local nature of local government politics will be changed to a great degree. “Councillors will be required to represent more voters over a greatly expanded geographic area. “Dolores was able to provide a very clear insight into the demands that public representatives at a local level will be taking on. Certainly there is a huge amount of work that still requires to be done. “And that rebuilding process of local bodies and institutions to meet the demands of politics in a new century needs to have the continuing financial and logistical support of Stormont,” Mr. McGreevy added. .